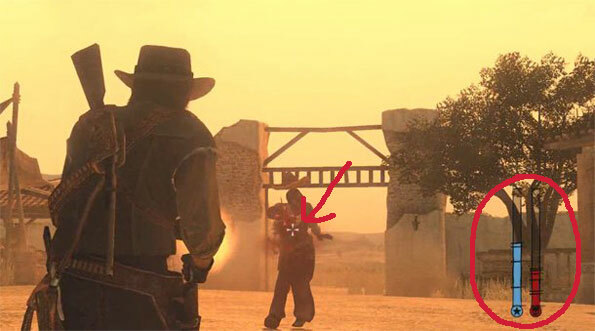 Dueling on Red Dead Redemption is very simple, yet has given myself and many others enough grief to warrant this quick ‘How To’. The basic concept is to draw your gun using LT (on Xbox 360), then aim using the right analogue stick (RS on Xbox 360). Mark your enemy with as many white crosshairs as possible in different places, this will build your blue meter on the right hand side of the screen. Providing the blue meter is higher than your dueling opponents red meter you will win. So simple, yet can easily end up in death if you fail to paint enough white crosshairs on your enemy. Once you follow this basic pattern you will win every duel, providing you are quicker than your enemy, which isn’t too difficult. White crosshairs on your enemy indicate a perfect shot over a red crosshair, waiting a split second will ensure the red crosshair turns to white, then move on to aim at a different part of the body. Remember to wait for DRAW to appear onscreen, this will give you the fame you deserve, draw too early and you will lose honor, but you will still win! Additionally you can shoot the gun out of someones hand mid duel with a carefully marked white crosshair, gaining you honor. I hope this helps you walk the wild west with confidence, giddy up cowboy! This entry was posted on May 31, 2010, 1:42 pm and is filed under PS3, Xbox. You can follow any responses to this entry through RSS 2.0. You can leave a response, or trackback from your own site. Limbo Walkthrough Guide – Stuck on Xbox Indie hit Limbo? Mass Effect 2 – Can’t Place the Monument at Normandy Crash Site? Trials HD Review – Xbox Live Arcade’s best title?